All year 12 students should be made to study intermediate mathematics if they want to enrol in a science, engineering or commerce degree at university, according to a national report by the Australian Academy of Science (AAS). “This is an absolutely critical issue. We’ve hit a pretty low point,” said the director of the Australian Mathematical Sciences Institute Professor Geoff Prince, who helped develop the report. A study of almost 50,000 maths students in the 2013 HSC (the NSW Curriculum Assessment), published in the Australian Journal of Education, revealed a scaling advantage for those who took the general mathematics course. But the shift by universities to list assumed knowledge rather than strict prerequisites for degree courses had caused fewer high school students to take harder maths courses and resulted in higher drop-out rates, found research by the Australian Mathematical Sciences Institute. “If it happened tomorrow it would cause a real shock to the education system because many schools don’t have the resources to be able to teach these [intermediate maths] subjects. “We need to give schools the time to adapt, and they may need some support to do so,” Professor Prince said. Among its 12 recommendations, the report also pushes for increasing professional development for out-of-field maths teachers. 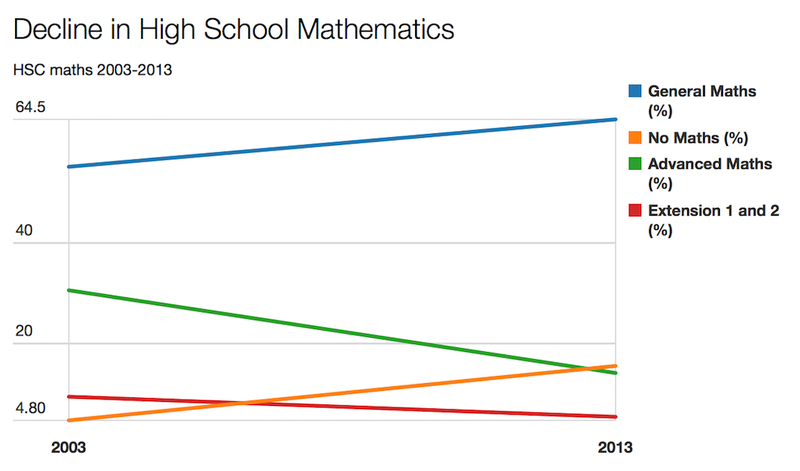 “The data we have is pretty emphatic: there is a very measurable difference in academic success … between students who have two-unit Mathematics [in Year 12] and those who don’t,” said University of Sydney deputy vice-chancellor Tyrone Carlin. Education minister Simon Birmingham, who is due to present the report at Parliament House, said it “laid clear path” for this generation of students and into the future. “Around 75 per cent of Australia’s fastest growing industries require science, technology, engineering and maths skills which is why we have committed $112 million for programs to encourage more students to get engaged in those areas,” Senator Birmingham said.